Freemasonry has existed in Dorset since 1736 with the creation of the Three Crowns Lodge (No. 145) at Weymouth. In 1785 they met at the 'Royal Oak' in High West Street, and this address is referred to in the 1790 publication in London of 'Jachin and Boaz; or an Authentic Keyt to the door of Free Masonry. In 1799 they met at the 'Antelope Inn' on Cornhill in the center of Dorchester where meetings remained there until 1830 when the lodge was erased. General correspondence relating to the lodge for years 1787, 1788, 1790-1792, 1800 and 1809-1811 is held at the Library and Museum of Freemasonry at 60 Great Queen Street, London WC2B 5AZ. Various Lodge numbers are used in correspondence but again 'Lanes Masonic Records' suggests that the original Lodge number was 476 and dates from as early as 1770? This became Lodge 381 in 1780 and 382 the following year. In 1792 it became Lodge 310 and is listed as such in "The Spirit of Masonry in Moral and Elucidatory Lectures" by William Hutchinson (page 344). From 1814 it became Lodge 395. The Lodge was Erased in 1830. EAMES, Thomas [In 1st Register] 1777 - June 5 28 Yeoman Fordington Accounts annotated Sep 1817 "Withdrawn"
BASCOMBE, John [In 1st Register] 1799 - May 1 45 Mercer Dorchester Accounts annotated March 1817 "Withdrawn"
SCOTT, George Peace [In 1st Register] 1805 - Nov 6 30 Innholder Dorchester Accounts annotated Dec 1819 "Withdrawn"
OLIVER, William N. K. [Blank] Innholder Dorchester Accounts annotated Dec 1815 "Resigned"
GOODRIDGE, John [In 1st Register] 1805 - Apr 6 30 Banker's Clerk Dorchester Accounts annotated Dec 1815 "Withdrawn"
ZILLWOOD, William (Junior) [In 1st Register] 1812 - Feb 3 35 Schoolmaster Dorchester Accounts annotated Mar 1818 "Dead"
PETT, John 1814 - Feb 2 50 Grocer Dorchester Last Entry Dec 1815 annotated "Resigned"
WRIGHT, John 1814 - Oct 5 50 Gentleman Charminster Last Entry Dec 1815 annotated "Resigned"
LAKE, Robert 1814 - Nov 23 25 Butler Kingston Last Entry Sep 1814? SHEPHERD, Thomas 1815 - May 4 25 Lieutenant R.N. Bridport Last Entry Mar 1815? ARDEN, George 1817 - June 25 [Blank] Attorney Weymouth Annotated Jun 1818 "Withdrawn"
TREN or TREW, George 1818 - Apr 23 [Blank] Grocer Romsey Last entry Dec 1818 - C Written in Red ink is "Erased by order of the Grand Lodge 1st Dec 1830"
In 1834 The Lodge of Faith & Unanimity was formed in Dorchester and consecrated on 21st August that year. They met in a new building situated on the corner of Allington and West Back Street (Now called Princess Street). It cost £468.3s. 1d and is shown in the picture above. (1). 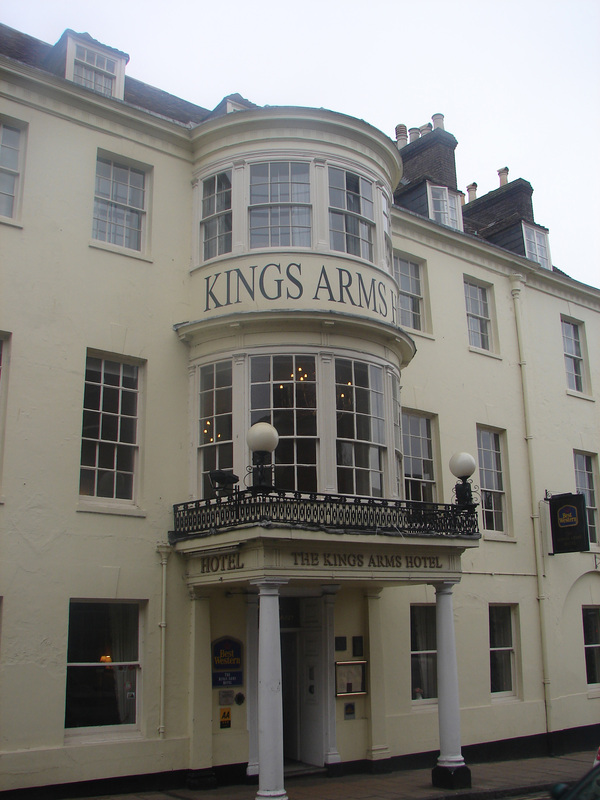 The KINGS ARMS HOTEL No. 30 and 30A High East street Dorchester with Stables and outbuildings which backs onto Friary Lane. 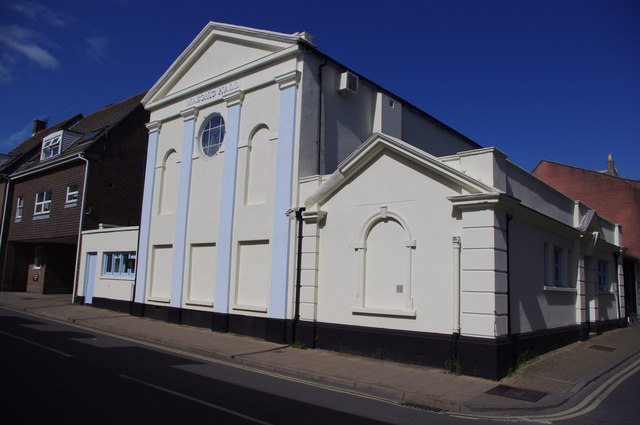 This building was Grade II listed on 8th May 1950 when it was described as being of "Late C18 or early C19". (1.3) bef 1767 From a Settlement Examination dated 7th April 1781 we know that William CHRISTOPHER (1745-1802), who was born in Fordington, worked for Mr Bryar at the Kings Arms in Dorchester as a chaise driver in the mid 1760's. We know it was before he obtained employment in Blandford which occurred about 4 years before he married Mary King at Blandford Forum on 3rd June 1771 so was before 1767. 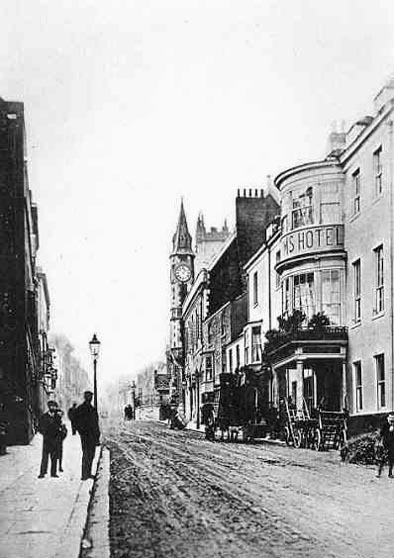 (1.13) 1852/3 Slater's Director of Dorchester :- INNS "Kings Arms Inn" William Manley, High East Street.